Give a colourful twist to your white chikan kurti with an elegant phulkari dupatta or a pair of embroidered jutti from The Punjabi Store. 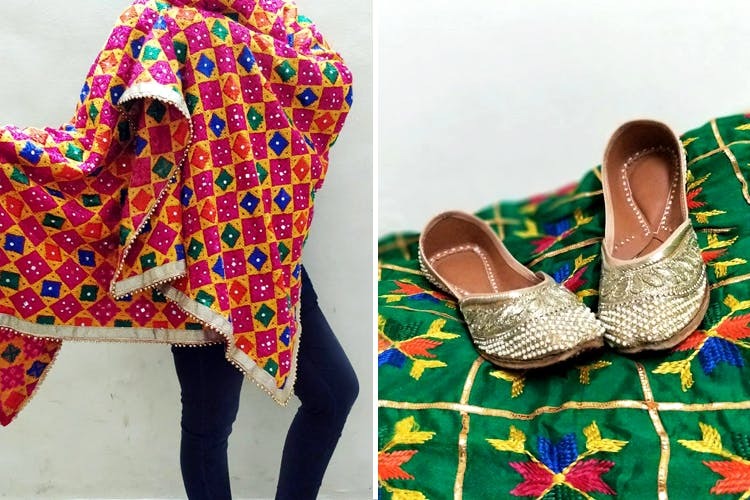 Started by two friends – Shikha & Eshan, this Pune-based fashion label is an Instagram shop that sells handcrafted phulkari dupattas and customised leather and embroidered jutis, from various parts of country, including Jammu, Punjab and Rajasthan. Fairly new, The Punjabi Store aims at providing a platform to lesser-know artisans who specialises in Indian handicrafts. Starting at INR 700, we are in love with the store’s collection of multi-coloured jutis in checks, stripes, floral prints, intricate mirror-work, sequins and more. The heavily-designed phulkari duppatas in aqua, emerald, hot pink and silver, ranging between INR 1,500 and INR 3,000, are a must for your wardrobe. You can place your order on their Instagram page and get it delivered to your doorstep. They only accept PayTM or bank transfer; cash on delivery is not available at the moment! Team up a pair of floral juttis from The Punjabi Store with your shirt dress or add some colour to your monotone kurti with a beautiful phulkari dupatta!